The computer labs are for academic purposes. NO downloading of software or files for non-instructional use. NO online chatting except for academic purposes. NO game playing allowed except for academic purposes. NO cell phone use in the open computer lab or any area of the libraries. Use headphones for any computer audio. Headphones may be checked out from the library help desk for in-library use. Keep voices low; quiet talking only permitted. Groups working on a project in the library may consider using a group/multimedia study room; ask at the help desk. Madison Area Technical College is not responsible for the integrity of your data contained on your storage devices or other locations. Do not attempt to repair any computer equipment or printers. Please ask for assistance from library staff. Library staff may request at any time the reason for your use of the computers and ask you to relinquish your workstation if it is not being used for academic purposes. Photo ID is required. 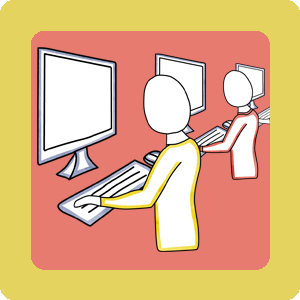 Community Users must register at the Student Computer Help Desk. The computers in the library are primarily for students taking classes at Madison Area Technical College. If the lab is busy, guest users may be asked to leave if the computers are needed for students. The library staff's primary responsibility will be assisting student who are enrolled in courses at Madison Area Technical College. Because of this community users may receive a limited amount of assistance depending on how busy the library staff are. Computer use is subject to all Madison Area Technical College Rights and Responsibilities and Library rules and guidelines.